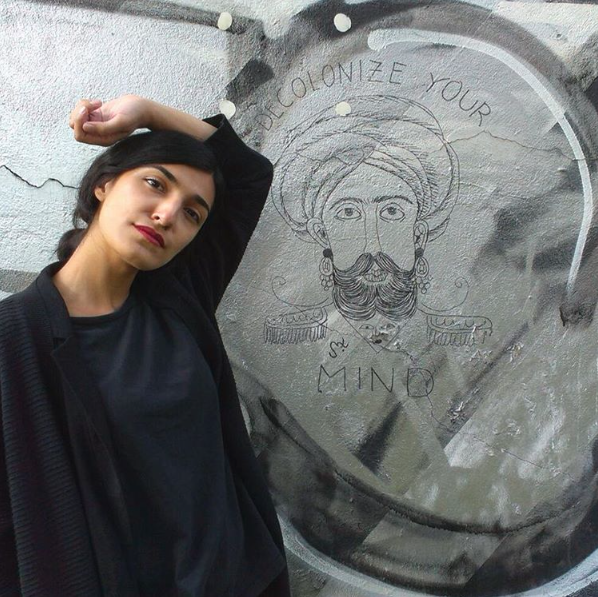 The Afghan artist explores issues of globalization, feminism and immigration. When illustrator Moshtari Hilal was two, she and her family arrived in Germany as refugees from Afghanistan. 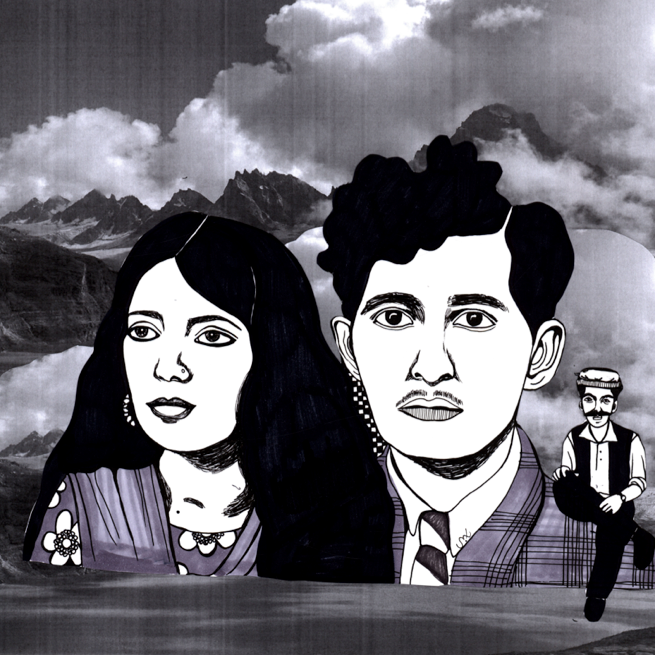 Her work explores the border-jumping world of Indo-Afghan culture and history. 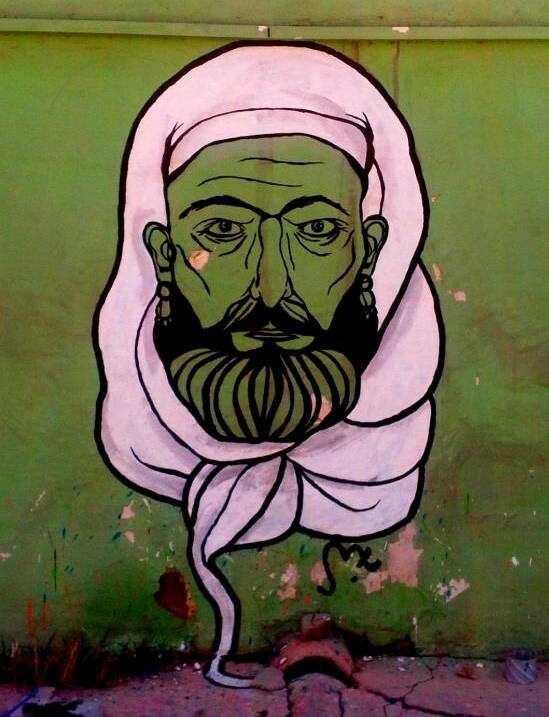 And as the Syrian refugee crisis has escalated, capturing global humanitarian attention, Hilal’s art remains topical. For Hilal, growing up in Germany as a refugee meant confronting Western society’s lack of empathy. Negative public opinion around immigration in the country and a lack of urgency to relieve the struggles of families like Hilal’s meant Hilal was caught between multiple difficult identities. These feelings spurred her project #embracetheface, a portrait series that critiques common Western beauty standards. It would be a mistake, though, to categorize Hilal’s work as a one-dimensional reaction to German “ethnic” supremacy. While her art is certainly informed by her experience of racism, its underlying motivation is not to just react but to transcend those limiting world views. Those ideas included post-colonial theory and the work of Islamic feminists, but it also included a critical analysis of older, so-called orientalist scholarship that she deeply disagreed with. “I wish to create a visual language — images narrating stories beyond white imperialism. I want to work out and make room for faces, memories, feelings, details which were displaced by the cultural and political violence caused by the colonial ideology,” she said. 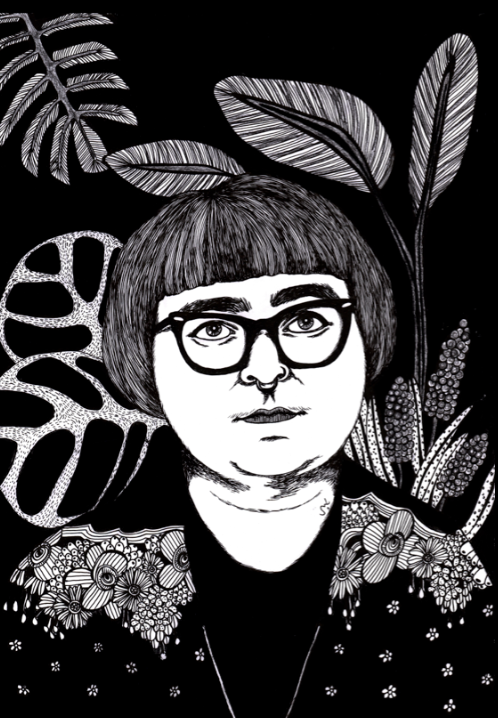 The people in the portraits stare out from the page, rendered in black ink with strong, defined strokes and a style somewhere between graphic novels and more naturalistic portraits. 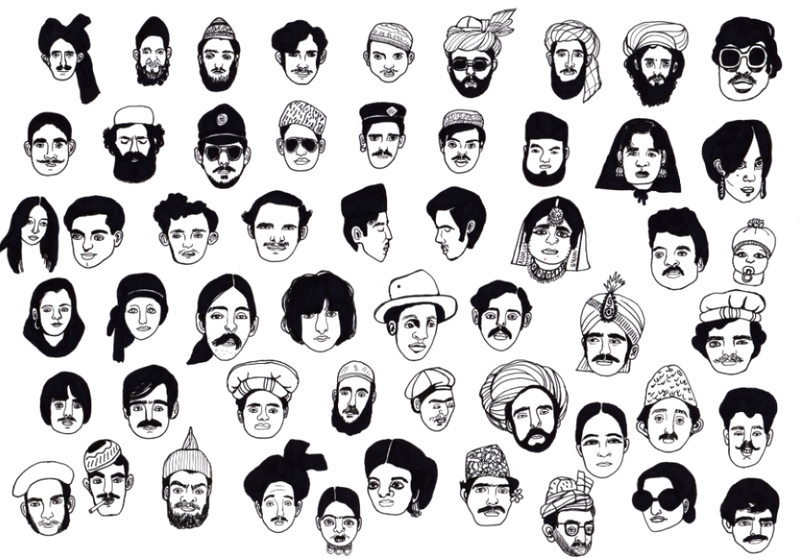 Hilal takes care to draw people as they were in those days, for instance in round pakol hats and turbans or with hippie hairstyles and dangling earrings. She spurs viewers to address the meanings they attach to different appearances and the prejudices that inform their opinions, especially appearances that they are conditioned to see as threatening — like an Afghan or Pakhtun man in traditional clothing. Her artistic practice is a kind of creative denial of the cultural power of enduring colonial attitudes about societies beyond Europe and the diasporic descendants of non-European cultures and histories. She draws inspiration from, and imparts significance to, another visual world — even another world at its most mundane, like a old-time Pakistani ‘one-hour photo’. The power of her work lies in its ability to remind us of those different worlds, and their importance, by presenting them in a stylized and engaging way, but without idealizing or mythologizing. She later returned to Kabul, Afghanistan as an adult and continued to illustrate her vision. Kabul, she said, was overwhelming, in ways both good and bad. The patriarchy of Kabul was a particularly jarring aspect of society that she came to terms with creatively. “That’s what I try to do with my art — express more fluid and hybrid concepts of sexual and cultural identities, but also create strong and cool characters to relate to,” she said. 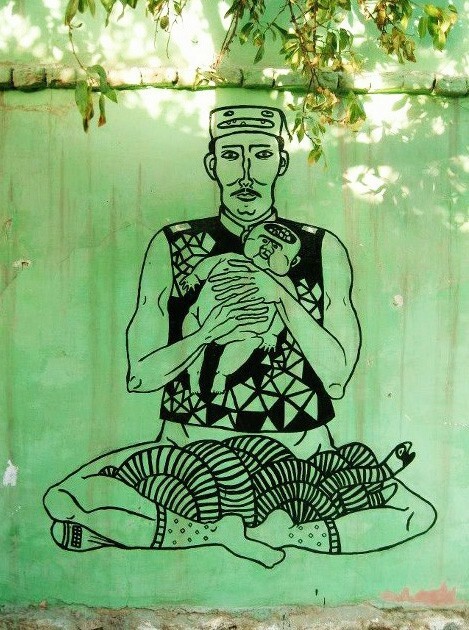 She painted men in elaborate, almost surreal, hats and headwraps on the city’s walls (above). One man wears a white headscarf. Another man holds to his chest affectionately a naked, chubby infant, who looks pretty happy except for the gaping, oval-shaped hole in its forehead. Refugees’ place in German society is a matter of heated debate today, as Syrians fleeing the war, as well as asylum seekers from many other countries including Afghanistan, are arriving in Germany hoping for security and acceptance. While Hilal believes that lately there has been more scope for Syrian asylum seekers to make art and tell their stories to a wide audience, she worries that the current liberal focus on “Refugees Welcome” may be no more than a passing fad. ‘‘There is no real willingness to rethink the concept and politics of borders and human mobility as long as you are blessed with a western state citizenship,” she said. 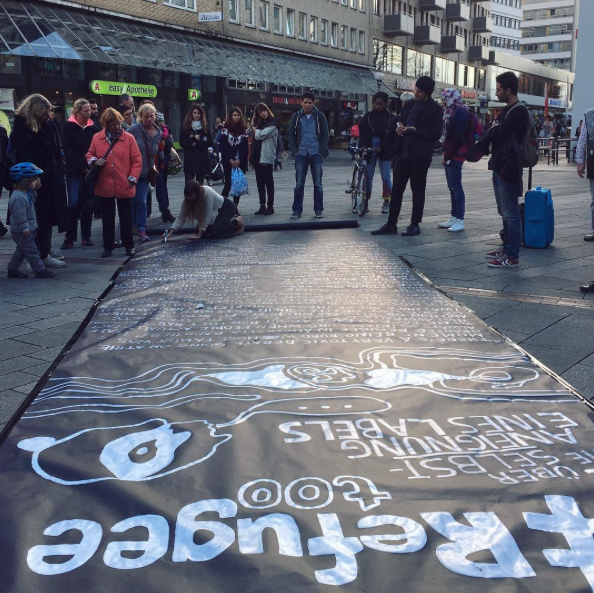 One of Hilal’s most recent outdoor art projects, #Refugeetoo, was an effort to keep the issue at the forefront of public discussion, while providing a space for those who identify as refugees to share their thoughts free of the control of media narratives. At the top of the scroll she wrote in neat block letters #Refugeetoo; underneath, in the open space between the title and the testimonies, the bold, broad lines characteristic of Moshtari’s style traced out interlocking faces and wispy cirrus clouds of thought bubbles spooling out of a curled hand. 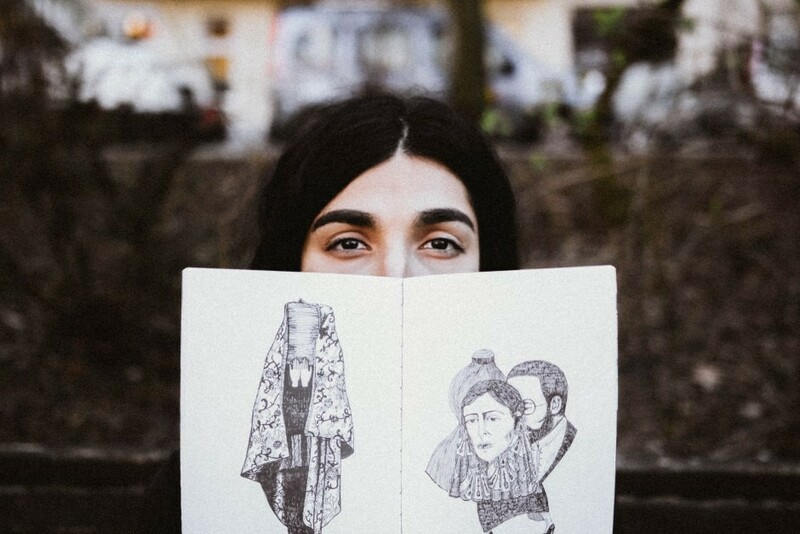 The best way to take on social ills like white supremacy, beauty standards, xenophobia, refugee migration, and patriarchy is through illustration, Hilal feels, though it may seem daunting. “I think we can’t underestimate the meaning of images and ideas — they are everything while reality means nothing sometimes,” she said.